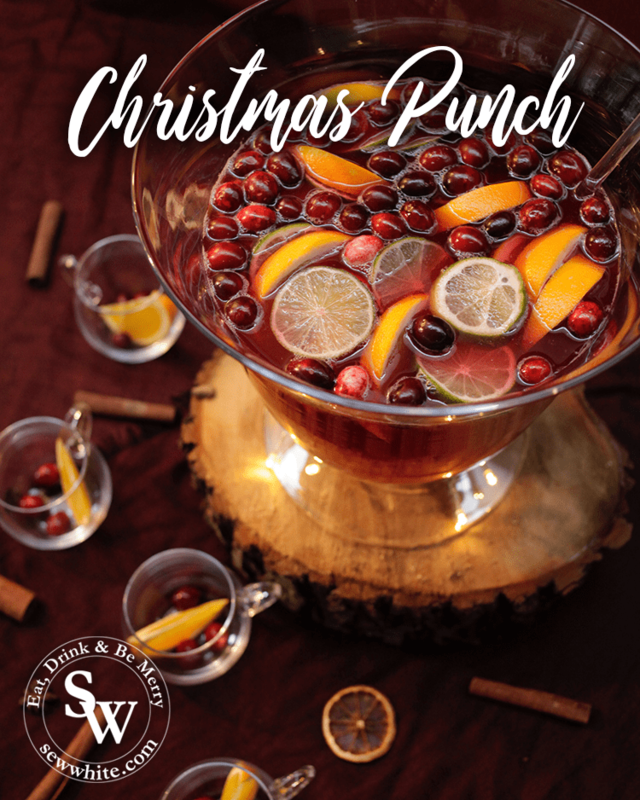 I have been coming up with delicious punch bowl cocktails for the festive season and this is my favourite so far for Christmas. It is made up of a fruity cranberry juice but gets a heat and fiery warmth from ginger beer and a little sharpness from fresh lime. It is the perfect time of the year to invite friends round for a drink and a little party in the glow of the fairy lights and by the warmth of the fire. I give you my festive mule! The variants on the mule are endless and the ginger beer fiery nature of the drink work so well with the cranberry juice. It makes it such a festive drink! This gorgeous handmade glass punch bowl set with 4 glass cups and ladle is from Houseology – my favourite place to buy kitchenware. They have a stunning range of useful and beautiful kitchen and eating gadget. I definitely recommend you take a look. This punch bowl holds 3.1 litres so for small parties it is a perfect way to keep everyone drinking without someone having to be the bartender for the night. I love putting the punch bowl in the middle of the table and letting everyone help themselves. It is also a great centre piece for a dining table. There is nothing better than getting your hands round a delicious winter warming Christmas cocktail! When I use the punch bowl I love putting the glasses next to them filled with a few decorative ingredients from the cocktail. I think they look stunning with a few cranberries and a slice of orange waiting for their cocktail! For this cocktail I used fresh cranberries (best not to eat them as they are a bit better), slices of lime and slices of oranges to give it a festive look and also give it a wow factor on the table. Add the cranberry juice and vodka to the punch bowl and top up with the ginger beer. Pop most of the cranberries in to the punch along with limes slices and oranges wedges. Use the remaining cranberries as decoration in the glasses the drink will be served in along with a thin slice of orange. Serve straight away with ice cubes into the glasses. You can put the ice into the punch but if left it will dilute the mix as it melts. How beautiful does this dining table look ready for a party! Disclaimer – I was the sent the punch bowl to review. All opinions are recipes are my own.